Description: The Popularity of #969 Ferris Wheel made way for this spin-off of sorts. Again we have a Little People set centered around a Swiss movement music box that propels a carnival ride into action when it is wound up. As in the Ferris Wheel, the Merry Go Round is run by the ever cranky mad boy, who lets all the riders know that he's woefully underpaid and overworked. Instead of, "In The Good Ol' Summertime", the song featured in the Merry-Go-Round is "The Skaters Waltz". The Merry-Go-Round has a masonite base and 4 seats for Little People riders. The seats resemble animal figures: a giraffe, pig, turtle, and a swan. 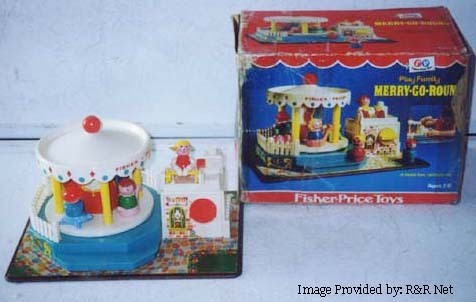 B111A - Merry-go-round with a masonite (wooden) base. The merry-go-round has a TURQUOISE plastic "base" with a step on the front leading up to the merry-go-round, and a short white picket fence on the side and back. The front has a round yellow turn knob that winds the swiss music box and plays "The Skater's Waltz". The top of the "ticket booth" has a permanently attached frowning boy who "turns" the merry-go-round mechanism. The boy has a WOODEN head, yellow plastic body, and a red sideways cap. *See "Variations" below. YZWW or YZWP - Medium Blue boy with a red sideways cap, smiling face with "" eyebrows and red freckles. GQWW or GQWP - Red girl with fancy eyes, and a blonde ponytail. YYWW or YYWW - Turquoise girl with blonde braids. EFWW or EFWP - Turquoise boy with a red sideways cap, smiling face with "" eyebrows and red freckles. B111A or B111B - Merry-go-round base. *See "Variations" below. EFWP - Turquoise boy with a red sideways cap, smiling face with "" eyebrows and red freckles. CCWP or CCPP - Green African-American boy with a red cowboy hat. EFWP or EFPP - Turquoise boy with a red sideways cap, smiling face with "" eyebrows and red freckles. GQWP or GQPP - Red girl with fancy eyes, and a blonde ponytail. B111B - Merry-go-round with a masonite (wooden) base. The merry-go-round has a TURQUOISE plastic "base" with a step on the front leading up to the merry-go-round, and a short white picket fence on the side and back. The front has a round yellow turn knob that winds the swiss music box and plays "The Skater's Waltz". The top of the "ticket booth" has a permanently attached frowning boy who "turns" the merry-go-round mechanism. The boy has a PLASTIC head, yellow plastic body, and a red sideways cap. *See "Variations" below. EFPP - Turquoise boy with a red sideways cap, smiling face with "" eyebrows and red freckles. FFPP - Medium blue girl with a brown sculpted bob. B111A - Turquoise base - mad boy who turns the crank: WOODEN head, yellow plastic body, and red sideways cap. B111B - Turquoise base - mad boy who turns the crank: PLASTIC head, yellow plastic body, and red sideways cap. B111C - Dark blue base - mad boy who turns the crank: WOODEN head, yellow plastic body, and red sideways cap. *Very rare. B111D - Dark blue - mad boy who turns the crank: PLASTIC head, yellow plastic body, and red sideways cap. *Very rare. B111E - Turquoise base - mad boy who turns the crank: WOODEN head, red plastic body, and yellow sideways cap. B111F - Dark blue base - mad boy who turns the crank: PLASTIC head, red plastic body, and yellow sideways cap. FP111BOX1972 - (BOX ONLY) - This set was sold in a box that pictures the #111 Play Family Merry-Go-Round. FP111SET1972 - (COMPLETE SET MIB) - Complete set MINT IN ORIGINAL BOX (unopened box) that pictures the #111 Play Family Merry-Go-Round.